The new catalyst for catalytic converters changes vehicle pollutants to relatively benign forms of nitrogen, carbon dioxide and water. The catalyst is stable at the high exhaust temperatures of a working engine but is active at the lower “cold-start” temperatures of today’s more efficient engines. Illustration by Cortland Johnson, PNNL. 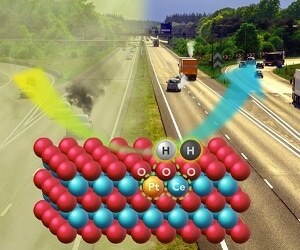 A team of researchers at Washington State University, Pacific Northwest National Laboratory and the University of New Mexico have developed a catalyst that can reduce pollutants at the lower temperatures anticipated in advanced engines. Their research, published recently in the journal Science, presents a new method to produce a more robust catalyst while using smaller quantities of platinum — the most expensive constituent of emission-control catalysts. Catalysts have been an essential part of diesel- and gasoline-powered engines since the mid-1970s when government regulations started requiring reductions of carbon monoxide, nitrogen oxides, and hydrocarbons. Catalytic converters change the pollutants to benign gases such as carbon dioxide, nitrogen, and water. The researchers took up the formidable challenge of creating a catalyst that could withstand engine exhaust temperatures of up to almost 750 °C (about 1,500 °F) encountered under high engine loads. At the same time, the catalyst should be able to work when an engine is started cold as well as be able to clean up the exhaust before realizing 150 °C — over 100 °C less than existing systems. The lower operating temperatures during cold start are because of increasing fuel efficiency in modern combustion engines, which leaves less energy in the tailpipe exhaust, said Abhaya Datye, an eminent professor at the University of New Mexico’s Department of Chemical & Biological Engineering and study co-author. Vehicle Exhaust Emissions - What are Vehicle Exhaust Emissions and Why are They a Problem? The latest findings were possible thanks to a partnership between research groups led by Yong Wang, who holds a joint appointment in Washington State University’s Gene and Linda Voiland School of Chemical Engineering and Bioengineering and the Pacific Northwest National Laboratory, and Datye’s catalysis group at New Mexico. The work builds on a study, published in Science last year, in which the Wang and Datye groups discovered an innovative way to capture and stabilize separate platinum atoms on the surface of cerium oxide, a typically used component in emissions control catalysts. The so-called single-atom catalyst uses platinum more efficiently while staying stable at high temperatures. Platinum normally trades at prices close to or even more than gold. For their recent paper, the team steam-treated the catalyst at 750 °C (nearly 1,400 °F). This caused the already stable catalyst to become highly active at the low cold-start temperatures. The research received funding from the U.S. Department of Energy. The research meets the requirements of WSU’s Grand Challenges, a suite of research initiatives aimed at large societal matters. It is mainly relevant to the challenge of sustainable resources and its subject of energy.